(UTAR) [JalanUniversiti, Bandar Barat, 31900 Kampar, Perak, Malaysia. University of Malaya [LembahPantai, 50603 Kuala Lumpur, Malaysia. This study aims to examine the dynamics of price changesand trading volume of Kuala Lumpur Options and FinancialFutures Exchange (KLOFFE) from 2000 to 2008. With augmentedanalysis, our results support two hypotheses. First, underinformation spillover, our findings support noise traders’ hypothesisas the time span for variance of past trading volumeto cause variance of current return is found to be asymmetricunder bull and bear markets. Second, looking at the dynamicrelation between volume and volatility of price changes, our findingssupport Liquidity-Driven Trade hypothesis as past tradingvolume and subsequent volatility of return exhibit positivecorrelation. In terms of investors’ behavior in response to thenews, we find that investors are more risk taking in bull marketand more risk reverse in bear market. Our study suggests thatinvestors should adjust their strategy in the futures market in adynamic manner as the time span of new information arrival isnot consistent. Also, uninformed investors with information asymmetryshould expect noninformational trading from informed investorsto establish their desired positions for better liquidposition. Many past studies examine information transmission between price and trading volume in the financial markets. Naturally, most of the market participants exhibit heterogeneous behavior towards risk over time. One can obviously observe the trading volume in an upward price movement is larger than the volume during downward price movement. However, there is a lack of study on the price - volume relationship that relates to good or bad news. Most importantly, do different market trends affect information spillover between price and trading volume over time? How investors behave in bull and bear markets? Hence, this study attempts to examine information arrival and spillover with respect to good or bad news for the Malaysian futures market. According to Fama (1970, 1991), the market is efficient when all available information, i.e. historical prices, public and private information are fully reflected in current price movement. However, if a market is inefficient, trading volume can be used to improve the availability of private information in ensuring accuracy of inferences about investors’ price signal (Blume, Easley & O’Hara 1994; Suominen 2001). Trading volume can directly assist investors to determine the expected payoff to their trading. The information on the interaction between price and trading volume becomes more crucial when the rise of asset price alternates frequently with the decline of asset prices. A number of past studies found that causality-in-variance represents the assimilation of information between financial markets. For instance, Ross (1989) claims that variance as a proxy for information arrival in the market is based on no-arbitrage martingale approach. Engle, Ito and Lin (1990) state causal effect in variance is an indication that market participants process new information to reflect the movement of market volatility directly over time. The early hypothesis of information arrival between price and volume is based on technical analysis which suggests that price and volume exhibit positive contemporaneous relationship (Clark 1973; Tauchen & Pitts 1983; Karopff 1987; Najand & Yung 1991). Subsequently, there are many studies indicate that size of trading volume over period tends to cause the subsequent movement of return (Copeland 1976; Jennings, Starks & Fellingham 1981; McCarthy & Najand 1993; Fujihara & Mougoue 1997; Malliaris & Urrutia 1998).They interpret positive price-volume correlation as information flow to the market in contemporaneous and sequential manners. Then, Lewellen, Schlarboum and Lease (1974), Shiller (1984), and De Long, Shleifer, Summers and Waldmann (1990) found that unpredictable traders’ action in their investment decision tends to cause high variation in price movement over time. Finally, Lakonishok and Smidt (1989) state that whether price and volume exhibit positive or negative relationship depends on a tax-related motive or a non-tax-related motive for current incentive of stock trading volume. Looking at the relation of volume-volatility, Wang (1994) framework provides the evidence of trading volume that contributes positively to subsequent volatility in return. Based on his findings, he proposes Liquidity-Driven Trade hypothesis to explain the positive and dynamic correlation between both series. He classifies investors into uninformed and informed investors. Liquidity-Driven Trade hypothesis is held when uninformed investors reflect a price increase because they perceive new needs of noninformational trading from the informed investors. It means uninformed investors take positions in the stock on the basis of their expectation about informed investors’ noninformational trading. However, Stickel and Verrecchia (1994) find that their findings contradict Wang’s findings. They propose Information-Driven Trade hypothesis in explaining the situation of negative correlation between trading volume and subsequent volatility. There are two expected contributions of this study. Firstly, it provides insight into the structure of financial market regarding the information flow process in two dissimilar market environments. This enables investors to understand the dynamic relation of price changes and volume in order to have better market timing. Secondly, it provides empirical evidence to support the hypotheses used to explain the information arrival and dynamic correlation between trading volume and volatility of return under two different market trends. This paper is organized as follows. This section is followed by literature review. The subsequent section touches on data and methodology, followed by findings and empirical results. The last section concludes the discussion and suggests the implication of this study. Osborne (1959) studied the price - volume relationship in his seminal paper and found that there was a relationship between stock price and volume. However, Granger and Morgenstern (1963) used spectral analysis and found that no relationship between absolute daily price changes and daily volume in New York Stock Exchange (NYSE) during 1939-1961. Most of the subsequent studies indicate that price and volume are positively correlated which support Osborne’s finding. For instance, Crouch (1970) found trading volume and absolute price changes in NYSE have a positive relationship. Epps and Epps (1976) found that the changes of logarithmic prices and transaction volume exhibited a mixture of finite variance distribution with positive correlation. In the Kula Lumpur Stock Exchange in the period of 1985-1992, Mohamad and Md Nassir (1995) have found finding to support positive relationship. Furthermore, they found that at different level of trading volume, this relationship was turned to be unambiguous. For 15 minute trading data of Hong Kong Stock Exchange, Ho, Cheung and Cheung (1993) found a positive price-volume relationship. In contrast, Pathirawasam (2011) found past trading volume had negative effect on stock return in the Colombo Stock Exchange as illiquid market caused low trading volume. Based on literature, information flow hypotheses between price and volume can be classified into four types. Most of the findings indicate that price and volume largely exhibit contemporaneous and dynamic causal relationships. For instance, McCarthy and Najand (1993), Fujihara and Mougoue (1997), and Malliaris and Urrutia (1998). These relationships were consistent with the mixture of distribution hypothesis (MDH) and sequential information arrival hypothesis (SIAH) respectively. MDH was the initial information flow hypothesis to explain price-volume relationship. According to Clarks (1973), price and volume responded instantaneously without any inter-temporal causal effect when new unexpected information arrived in the market. This hypothesis was further supported by Epps and Epps (1976), Tauchen and Pitts (1983), and Karpoff (1987). With the application of generalized method of moments (GMM) procedure for each 30 Dow Jones firms in the period from 1982 to 1986, Richardson and Smith (1994) found that unobservable information flow has followed weak MDH due to lognormally distributed information flow. Bhar and Hamori (2004) detected existing of dependence on causality in variance and found evidence of strong contemporaneous relationship existed in gold futures market in the period from 1990 to 2000. Canarella and Pollard (2011) divided the period from1995 to 2002 for Russian stock market into four sub-periods that contained stock market crash, financial crisis and some political events. After trading volume as an exogenous variable was included in GARCH (1,1) model for return, they found that trading volume had a direct effect on variance of return that supported contemporaneous information flow. In contrast, trading volume had indirect effect on the mean of return. In another strand of research, Copeland (1976) and Jennings et al. (1981) found that relationship of both series exhibited lead and lag behaviors. Their findings supported SIAH where information on volume requires time to be reflected on price movement in the future. Their findings were further supported by other studies. For instance, the study on crude oil futures market by McCarthy and Najand (1993) as well as the study on petroleum futures markets by Fujihara and Mougoue (1997). Using threshold co-integration model in six agriculture futures markets, Malliaris and Urrutia (1998) found that causal effect from price to volume was stronger than volume to price. Similarly, Kocagil and Shachmurove (1998) used the decomposition of forecasted variance model and found that variance of return caused variance of volume in the crude oil futures market. Final hypothesis was proposed by Lakonishok and Smidt (1989) where they found that past stock price changes has negative relationship with current tax-related motive trading and positive relationship with current for non-tax-related motive trading. Therefore, they concluded that direction of relationship between price and volume depended on how investors acted to stock price changes based on a tax related trading or a non-tax related trading. Based on the literature, dynamic volume-volatility relation could be explained through two hypotheses. They were classified as Liquidity-Driven Trade and Information-Driven Trade hypotheses. The Liquidity-Driven Trade hypothesis was proposed by Wang (1994) to explain the positive correlation between trading volume and subsequent volatility. He examined price and trading volume dynamic among investors who have heterogeneous information. His model is able to capture two types of heterogeneity among investors, which are heterogeneous in investment and information opportunities. From the study of Liorente, Michaely, Saar and Wang (2002) on dynamic volume and return relation of individual stock in NYSE and AMEX, they found that high-volume days would lead to speculative-motivated trades exhibited more return continuation. This could reflect to the positive relationship between returns and trading volumes. Whereas, high-volume days would lead to hedging-motivated trades exhibited more stock return reversals. This could reflect to negative relationship between returns and trading volumes. They concluded that public information on future payoffs, investors’ hedging trades and investors’ speculative trades tend to generate different dynamic relationships between return and volume. Through multivariate and graphical analyses on NASDAQ stocks from1982 to 1990 period, Stickel and Verrecchia (1994) found that weak changes in volume on previous day would contribute to large price changes on the next day. This evidence of negative correlation between return and trading volume supported Information-Driven-Trade hypothesis. Their finding implied that investors should be cautious to interpret large daily stock price changes due to weak volume. Connolly and Stivers (2003) found the evidence of Information-Driven Trade hypothesis in U.S. equity indices, index futures and individual stock from 1962 to 2000. Their finding indicated that unexpected high turnover in trading volume led to substantial momentum in consecutive weekly stock returns. The phenomenon of asymmetry in price-volume relationship was first studied by Ying (1966) where it was found that ratio between absolute volume and price change was different for positive and negative price changes in NYSE from 1957 to 1962. Epps (1975) found that trading volume that associated with positive price change was larger than trading volume that associated with negative price change. Based on Epps’s model, Copeland (1976) classified traders in bear market to be uninformed traders and in bull market to be informed traders. For absolute value of price changes and volume, Jennings et al. (1981) further argued that uninformed and informed traders’ reaction could affect this relation where uninformed traders reacted as pessimistically and informed traders reacted as optimistically. Smirlock and Starks (1985) found Ying’s conclusion may be invalid because stock price and volume data are not comparable. They used Epps’s model and found volume was higher when there was positive price changes as compared than negative price changes, implying asymmetric effect depended on information arrival. Their results further indicated that some contrary evidence when there was the combined effect of positive transaction costs and no information arrival when testing occurs trading days. Jain and Joh (1988) found that average volume traded and returns were significantly different across hours, days and weeks. McInish and Wood (1990) found the pattern of U-shaped for intraday trading volume as the evidence to support asymmetry of price-volume relation in the Istanbul Stock Exchange. Lam, Li and Wong (1990) found that weak positive relationship between price changes per se and trading volume could contribute asymmetric effect in the Hong Kong stock market. In the Canadian stock market, Assogbavi, Khoury and Yourougo (1995) found ratio of short positions to number of shares outstanding was greater than long positions. They also found that trading volume associated with price increases was greater than trading volume associated with price decreases. In the Australian market, Brailsford (1996) found that the slope of volume-price change for a positive return was steeper than negative return. Cooper, Downs and Patterson (2000) used a filter-rule methodology on real estate asset markets. Their finding supported existence of information asymmetry would cause the changes in dynamic of causal relationship between return and volume. This study uses daily data of KLOFFE futures price and trading volume from February 23, 2000 to January 11, 2008. The data are collected from DataStream. In order to reduce variation and achieve stationary movement of series, daily futures prices are transformed to returns by using equation (1) as below. where, Pt is the current price (Ringgit Malaysian, RM) at t and Pt−1 is the price at preceding t . ln stands for natural logarithm. Volume t is trading volume (the number of contracts traded) at period t . In order to reduce variation, this series is transformed into natural logarithmic form by using equation (2). Based on equations (3), (4), (5) and (6), Rt and Vt are denoted as return and trading volume at period t respectively. and are denoted as conditional variance for return and trading volume at period t respectively. εR,t andε V ,t are the unexpected return and trading volume that cannot be predicted based on all information available up to the preceding period (φt-1 ) respectively. The second step is to obtain standardized residuals in level and squared forms for estimated univariate equations. In the level form, these standardized residuals are denoted as U t and Wt respectively. In the squared form, they are denoted as U2 t and W2t respectively. Then, these standardized residuals in level and square forms are used to compute sample cross-correlation(corr) at lag k by using equations (7) and (8). where, corr UW (k )is the k th lag sample cross-correlation between standardized residuals for return and trading volume. (0) C UU and (0) CWW are sample variances of standardized residuals for return and trading volume. corr U2 W2 (k )is the k th lag sample cross-correlation between standardized squared residuals for return and trading volume. (0) CU2 U2 and (0) CW2W2 are the sample variances of standardized squared residuals for return and trading volume. Based on univariate equation, we test feedback causal effect in mean and variance of both series at specified lag k . Null hypothesis of no feedback causal effect in mean is rejected when absolute value of test statistic (equation 9) greater than standard normal critical value. This implies that there exists feedback causal effect in mean between both series. There exists feedback causal effect in variance between both series when null hypothesis of no causal effect in variance is rejected when absolute value of test statistic (equation 10) greater than standard normal critical value. The third step is to analyze the augmented relationship of both series when the interaction between return and trading volume is taken into account. When augmented variables are included into equations (3), (4), (5) and (6), this analysis can be done through augmented equations as below. From equation (11) to equation (14), Rt and Vt are denoted as return and trading volume at period t. and are denoted as conditional variance for return and trading volume at period t . εt is denoted as the disturbance term at period t conditional to all information available up to the preceding period. Finally, the fourth step is to compute cross-correlation of standardized residuals and standardized squared residuals from augmented equations by using equations (7) and (8). If absolute test statistic value from equation (10) greater than standard normal critical value, return and trading volume exhibit information spillover between them. Our study begins with identification of bear and bull periods for KLOFFE futures market through detecting market turning points. Based on Figure 1, futures price movement during the beginning of sample period is unstable and more volatile. This was associated with the significance of economic events that happened during Asian financial crisis, 1997-1998. This crisis dampened investors’ confidence in stock markets, where equity market performance had declined with losses from 1997 to early 1998. After this financial crisis, there are three turning points that have been found in the Figure 1. The dates for turning points are 23 February 2000, 25 Mach 2003 and 11 January 2008. The sample period (23 February 2000-25 Mach 2003) from local high point to next local low point is called as a bear market. After this sample period, the sample period (25 Mach 2003-11 January 2008) that begins from local low point to the highest point exhibits upward price movement is called as a bull market. Table 1 shows summary statistics of futures return and trading volume during two different market trends. For trading volume, mean of 497.0581 futures contracts during bear market is less than mean of 1710.6342 futures contracts during bull market, which indicates that a small trading volume is usually accompanied by a fall in price. This implies that market participants tend to decrease their trading volume when they receive bad news. The standard deviation of 1.3326for return during bear market is higher than standard deviation of 0.0103 for return during bull market. This implies that downward trend in price movement exhibits higher volatility as compared to upward trend. For correlation between return and trading volume, there exists a weak negative correlation of both series, where it implies that market participants less depend on past return and volume data in their futures market trading. This correlation is different during bear and bull markets, where correlation of -0.0610 during downward movement is found to be stronger than correlation of -0.0252 during upward movement. This implies that market participants respond faster to information about return and trading volume in bear market as compared than bull market. Return and trading volume series are also examined for the presence of unit root. The results of unit root tests with augmented Dickey-Fuller (1979) and Phillips-Perron (1988) show that both series are stationary. Table 1. Descriptive StatisticsNotes: 1. R and V are denoted as daily return and daily trading 2. The daily return in the natural logarithm form is used to construct descriptive statistics and unit root test. 3. The daily trading volume in the level form is used to compute mean, standard deviation, maximum and minimum, while the natural logarithms form of this series is used to examine the distribution and stationarity. 4. P-value is the probability value associated with the Jarque-Bera test statistics. 5. DF= Dickey-Fuller and PP = Phillips-Perron. *** and ** indicate null hypothesis that there exists a unit root is rejected at the 1 % and 5 % levels of significance. Our study starts with univariate analysis of both series in bear and bull markets. The optimal lag length is chosen based on autocorrelation function (ACF) and partial autocorrelation function (PACF) of series as well as the minimum value of Schwarz’s (1978) Bayesian information criteria (SBC). The further examination of ACF and PACF on squared residual is to confirm the existence of GARCH effects. The examination of ACF and PACF on squared return and trading volume during bear market suggest conditional mean of return and trading volume follow ARMA (2,4) process and ARMA (1,4) process. During bull market, conditional mean of both series follow AR (3) process and ARMA (1,4) process. The further examinations of ACF and PACF on squared residual in bear and bull markets confirm that return exhibits GARCH (1,1) process. In explaining conditional variance of return in both markets, exponential GARCH (1,1) process as equations (14) and (17) are found to have a better explanation on return than GARCH (1,1) process because two reasons. First, it can capture negative value of intercept which do not make sense in GARCH (1,1) model. Second, it provides higher log-likelihood value than GARCH (1,1) model. The examination of ACF and PACF on squared residual confirms that no GARCH effect exists in trading volume during both market trends. Therefore, we conclude that models for return are ARMA(2,4)-exponential GARCH(1,1) and AR(3)-exponential GARCH(1,1) during bear and bull markets respectively. Meanwhile, models for trading volume are ARMA(1,4) during bear and bull markets respectively. These models are written as equations (15), (16), (17), (18), (19), and (20) as below. The estimation results from these equations are summarized in Table 2. 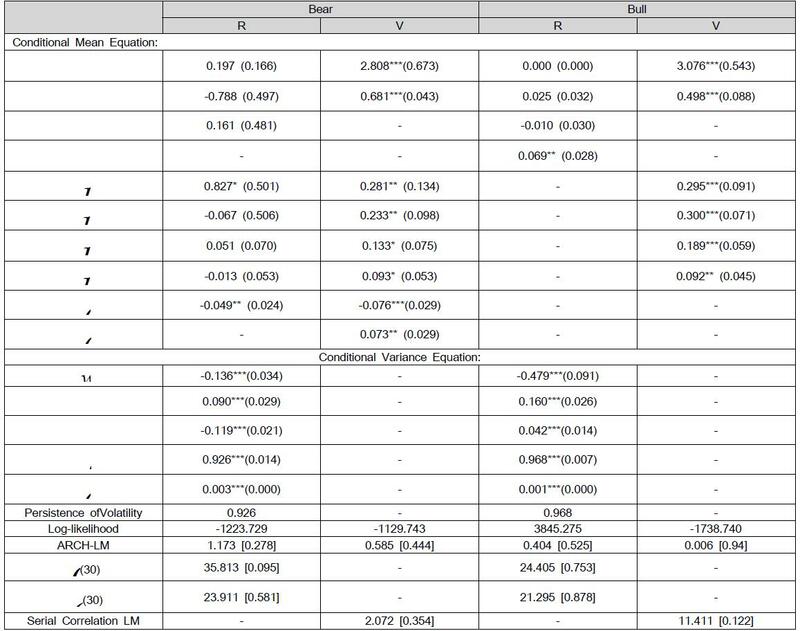 Based on Table 2, the significance of ARCH and GARCH coefficients in variance of return equations implies volatility clustering in return during both market trends. The persistence of 0.9568 and 0.9746 in return volatility during bear and bull markets are less than unity which implies that volatility in return is stationary and stable during both markets. Ljung-Box (1978) and series serial correlation Lagrange Multiplier (LM) tests indicate that no autocorrelation problem. The ARCH-LM test indicates that no heteroscedasticity problem. These suggest that the selected specifications explain the data adequately. Table 2. Empirical Results of Univariate Model Estimations Notes: 1. ***, ** and * indicate as significant at the 1%, 5% and 10% levels respectively. 2. All standard error of estimators are reported in ( ). 3. Persistence of volatility is measured through β1 4. 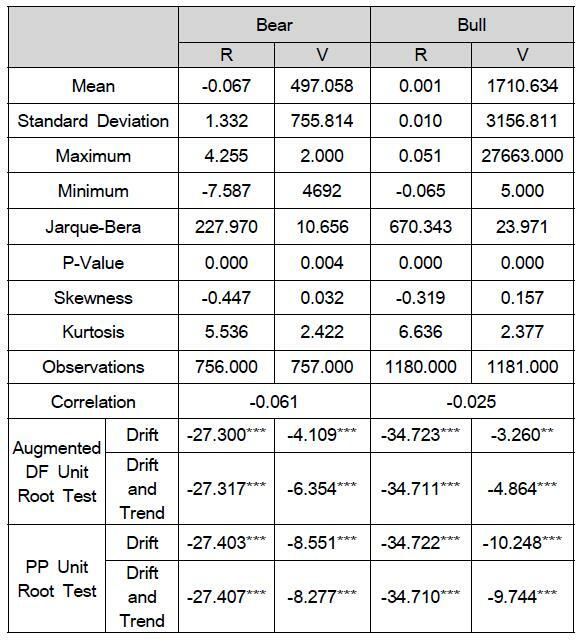 Q and Q2 test statistics are denoted as Ljung-Box Q test statistics for standardized and standardized squared residuals. 5. All the p-values are reported in the [ ]. 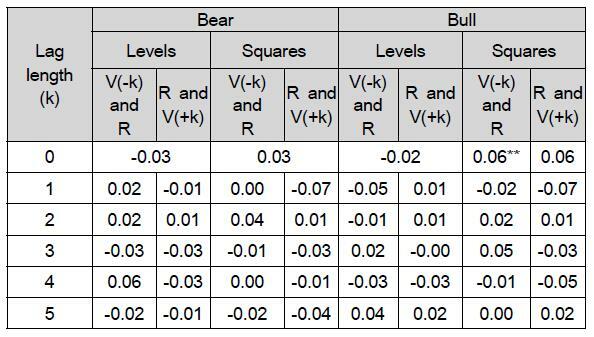 In Table 3, cross-correlations under the "Levels"column are used to test causality in mean. In the "Squares" column, its cross-correlations are used to test causality in variance. The column headings "R and V (-k)" refers the number of days trading volume data lags behind the return data. The significance of its cross-correlations implies that past daily trading volume causes current daily return. The column heading "R and V (+k)"refers as number of days return data lags behind the trading volume data, where the significance of its cross-correlations implies that current daily return causes future daily trading volume. 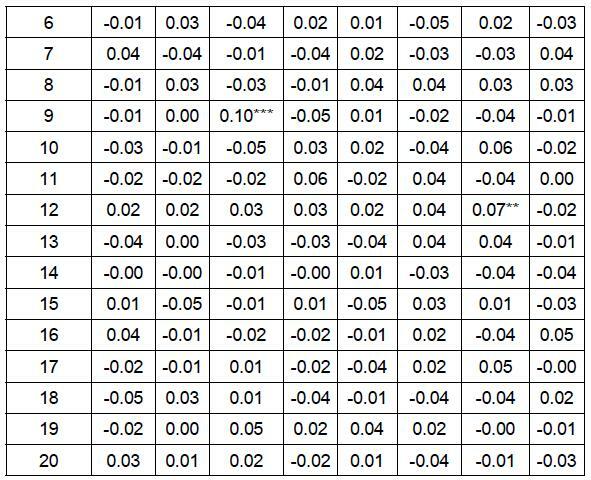 All cross-correlations in Table 3 are used to test feedback causal effect in mean and variance up to twenty lags without take interactive effect into account. 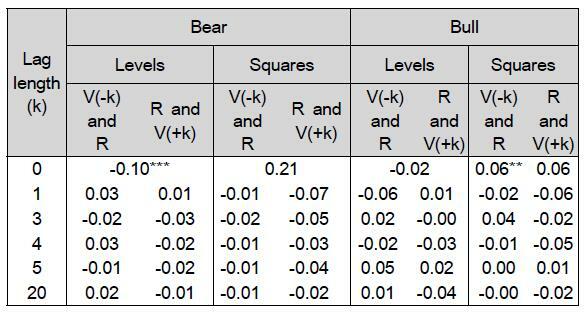 As observed at "Levels" column in Table 3, we find that feedback causal effect in mean between return and trading volume happens clearly during bear market instead of bull market. At "Levels" column for bear market, significant correlation between standardized residual of return and residuals of volume of -0.1 at lag 0 indicates that mean of return and mean of trading volume respond contemporaneously. In the same column for "Levels", significant correlation between current standardized residual of return and future residuals of volume of 0.08 at lag 10 indicates that mean of current return causes mean of trading volume movement after 10 days. As observed in the "Squares" column on bear market, the significant correlation between past squared residuals of volume and current squared standardized residual of return of 0.11 at lag 9 implies that information is transmitted from trading volume from 9 days ago to reflect the volatility movement of current return. In the bull market, the significant correlation between past squared residuals of volume and current squared standardized residual of return of 0.06 at lag 0 implies that information is transmitted from trading volume to return at the same time. Both causalities in variance from past trading volume to current return happen when spill overs in mean and volatility are not taken into account. 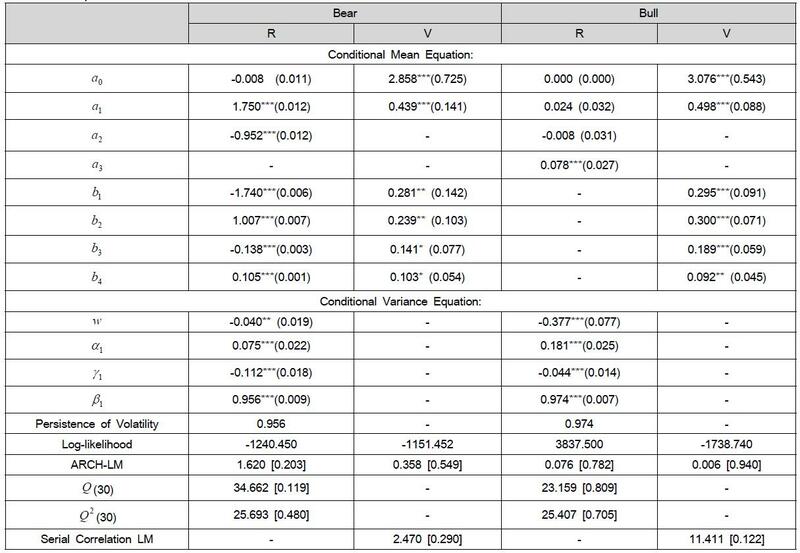 Based on the results for bear market in Table 3, we fit the augmented model by incorporating lag 0 of trading volume into equation (15) for conditional mean of return. With augmented lag 0 of trading volume, equation (15) shows the conditional mean of return and its specified as ARMA(2,4). We include lag 9 of squared trading volume into equation (16) for conditional variance of return as it is found that variance of past trading volume causes variance of current trading volume at lag 9, so the augmented conditional variance of return equation is denoted as equation (22). Table 3. Cross-correlation functions based on the Results from Table 2 Notes: 1. 1% critical value of ± 2 .58 and 5% critical value of ± 1 . 96 . 2. *** and ** indicate as significance at the 1% and 5% levels respectively. The empirical results in Table 3 show mean of return and mean of trading volume respond contemporaneously at lag 0, and mean of current return causes mean of trading volume after 10 days. In order to capture these effects, we include lags 0 and 10 of returns into equation (17) to become equation (23) for conditional mean of trading volume. Based on the results for bull market in Table 3, there is no evidence that feedback causality in mean between return and trading volume. Hence, equation (18) for conditional mean of return and equation (20) for conditional mean of trading volume remain as equations (24) and (26)respectively. The current squared trading volume is included into equation (19) to become equation (25) because empirical results show feedback causality in variance running from trading volume to return at lag 0. Based on the univariate analysis, we propose and estimate the following augmented models for the return and trading volume data during bear and bull markets. The estimated augmented models are summarized in Table 4. Based on estimation results in Table 4, dependence causality in mean and variance are further tested and their results are summarized in Table 5. The maximum likelihood estimates for return and trading volume models are presented in Table 4. In "Bear" column, the log-likelihood has increased from -1240.450 (Table 2) to -1223.729 (Table 4) for return model, while the log-likelihood has increased from -1151.452 (Table 2) to -1129.743 (Table 4) for trading volume model. In "Bull" column, the log-likelihood has also increased from 3837.5 (Table 2) to 3845.275 (Table 4) for return model. This implies that there is an increase of explanatory power in augmented models for both series. This shows that the importance of incorporating mean and variance spillover effects to ensure the accuracy of condition mean and variance estimations. The log-likelihood of -1738.740 (Table 2) for equation (20) are same as log-likelihood for equation (26) (Table 4) because no lagged of return is included into the conditional mean of trading volume equation. Table 4. Empirical Results of Augmented Model EstimationsNotes: 1. ***, ** and * indicate as significant at the 1%, 5% and 10% levels respectively. 2. All standard error of estimators are reported in ( ). 3. Persistence of volatility is measured through β14. Q and Q2test statistics are denoted as Ljung-Box Q test statistics for standardized and standardized squared residuals 5. All the p-values are reported in the [ ]. The estimated persistence of return volatility for equations (22) and (25) are presented in Table 4. During bear market, the incorporate of lag 9 of squared trading volumes into conditional variance of return causes persistence of 0.9568 (Table 2) for equation (16) declines by 0.0305 to become 0.9263 (Table 4) for equation (22). During bull market, persistence of 0.9746 (Table 2) for equation (19) slightly declines by 0.0057 to be become 0.9689 (Table 4) for equation (25) after lag 0 of trading volume is included. This implies that trading volume contains little information about the disequilibrium dynamics of asset prices in upward movement as compared to downward movement. For diagnostic checking, Ljung-Box, series serial correlation LM and ARCH-LM tests suggest that these augmented models fit well to these data. After we estimate augmented models that capture the interaction of KLOFFE returns and trading volumes in both market trends, we obtain cross-correlations of standardized residuals and their squares and summarize their values in Table 5. The cross-correlations of standardized residuals in "Levels" column are used to detect dependence causality in mean, while cross-correlation of standardized squared residuals in "Squares" column are used to detect dependence causality in variance. As observed at "Levels" column, there is an absence of dependence causality in mean between returns and trading volumes during bear and bull markets. For this study, we emphasize significant correlations between squared residuals of volume and squared standardized residual of return at "Squares" column since dependence causality in variance acts as the proxy for information flow of interaction between returns and trading volumes. At "Squares" column, we observe correlation of 0.10 between past squared residuals of volume and current squared standardized residual of return at lag 9 during bear market is significant at 1 percent level, while correlation of 0.07 between past squared residuals of volume and current squared standardized residual of return at lag 12 during bull market is significant at 5 percent level. Both correlations indicate that dependence causality in variance from trading volume to return happen in both market trends. In terms of time span, we find that information about trading volume requires longer time which is 12 days to spill over to return during bull market as compared to 9 days during bear market. There is no evidence of causality in variance from return to trading volume in both market trends. For information arrival hypothesis, our results support noise traders’ hypothesis of interaction of return-volume as information arrival from past trading volume to current futures return under two different price trends exhibits an asymmetric effect in terms of time span and degrees of correlation between volume and volatility of returns. For volume-volatility hypothesis, past trading volume is positively correlated with subsequent volatility of return that support Liquidity-Driven Trade hypothesis. Table 5. Cross-Correlation Functions based on the Results from Table 4 Notes: 1. 1% critical value of ± 2 .58 and 5% critical value ± 1 . 96 . 2. *** and ** indicate as significance at the 1% and 5% levels respectively. Based on the study of Mohamad and Md Nassir (1995) on the Kuala Lumpur Stock Exchange, they use causality test based on linear approach to examine price changes and trading volume relationship. Since non-linearity exists in financial time series data, linear approach can longer be viewed as an adequate method to predict movement of market price (Hinich & Patterson 1985: 69). We extend their study with non-linear approach under upward and downward price trends based on cross-correlation function. By using the framework of ARMA-GARCH models which are estimated during upward and downward price trends, some robust results are produced. Firstly, information arrival of futures return and trading volume under two different price trends exhibits an asymmetric effect in terms of time span and correlation between volume and volatility of returns. This is probably due to traders in futures market who exhibit noise-trading behavior. Secondly, past trading volume is positively correlated with subsequent volatility of returns which supports Liquidity-Driven Trade (LDT) hypothesis. Shorter lags of 9 days and weaker correlation of 0.07 between past squared residuals of trading volume and current squared standardized residual show that market participants with bearish expectation tend to react faster in making decision based on new information and exit the market within shorter time span as compared to bull market. Based on the results, risk appetite of market participant varies according to different market trends, and hence investors should adjust their strategy in futures market in a dynamic manner as time span of new information arrival is not consistent. They should expect changes in trading volume to be followed by bigger volatility of price changes in subsequent period. With information asymmetry, the expected non-informational trading from informed investors is important for uninformed investors to establish their desired positions for liquidity. 1.Andersen, T.G. (1996). Return Volatility and Trading Volume: An Information Flow Interpretation of Stochastic Volatility. Journal of Finance, 2(51), 169-204. 2.Assogbavi, T., Khoury, N., & Yourougo, P. (1995). Short Interest and the Asymmetry of the Price-Volume Relationship in the Canadian Stock Market. Journal of Banking and Finance, 19(8), 1341-1358. 3.Bhar, R., & Hamori, S. (2004). Information Flow between Price Changes and Volume in Gold Futures Contracts. International Journal of Business and Economics, 3(1), 45-56. 4.Bhar, R., & Hamori, S. (2005). Causality in Variance and the Type of Traders in Crude Oil Futures. Energy Economics, 27(3), 527-39. 5.Bloomfield, R., O'Hara, M., & Saar, G. (2009). How Noise Trading Affects Markets: An Experimental Analysis. Review of Financial Studies, 22(6), 2275-2302. 6.Blume, L., Easley, D., and O'Hara, M. (1994). Market Statistics and Technical Analysis: The Role of Volume. Journal of Finance, 49(1), 153-181. 7.Brailsford, T.J. (1996). The Empirical Relationship between Trading Volume, Returns and Volatility. Accounting and Finance, 36(1), 89-111. 8.Campbell, J.Y., & Kyle, A. (1987). Smart Money, Noise Trading and Stock Price Behavior. NBER Technical Working Paper, No. 71, National Bureau of Economic Research. 9.Canarella, G., and Pollard, S.K. (2011). The Mixture of Distribution Hypothesis and the Russian Stock Market. Journal of Business and Economics Research, 1(11), 43-58. 10.Cooper, M., Downs, D.H., & Patterson, G.A. (2000). Asymmetric Information and the Predictability of Real Estate Returns. Journal of Real Estate Finance and Economics, 20(2), 225-44. 11.Copeland, T.E. (1976). A Model of Asset Trading under the Assumption of Sequential Information Arrival. Journal of Finance, 31(4), 1149-1168. 12.Cheung, Y.M., & Ng, L.K. (1996). A Causality in Variance Test and Its Application to Financial Market Prices. Journal of Econometrics, 72(1), 33-48. 13.Clark, P. (1973). A Subordinated Stochastic Process Model with Finite Variance for Speculative Process. Econometrica, 41, 135-155. 14.Connolly, R., & Stivers, C. (2003). Momentum and Reversals in Equity-Index Returns during Periods of Abnormal Turnover and Return Dispersion. The Journal of Finance, 58(4), 1521-1556. 15.Crouch, R.L. (1970). The Volume of Transactions and Price Changes on the New York Stock Exchange. Financial Analysts Journal, 26, 104-109. 16.De Long, J.B., Shleifer, A., Summers, L., & Waldmann, R. (1990). Noise Trader Risk in Financial Markets. Journal of Political Economy, 98, 703–738. 17.Dickey, D.A., & Fuller, D.A. (1979). Distribution of the Estimators for Autoregressive Time Series with a Unit Root. Journal of American Statistical Association, 74(366a), 427-31. 18.Dickey, D.A., and Fuller, D.A. (1981). Likelihood Ratio Statistics for Autoregressive Time Series with a Unit Root. Econometrica, 49, 1057-1072. 19.Edward, S., and Susmel, R. (2001). Volatility Dependence and Contagion in Emerging Equity Markets. Journal of Development Economics, 66(2), 505-532. 20.Engle, R.F., Ito, T., & Lin, W.L. (1990). Meteor Showers or Heat Waves? Heteroskedasticity Intra-Daily Volatility in the Foreign Exchange Market. Econometrica, 28, 525-42. 21.Epps, T.W. (1975). Security Price Changes and Transaction Volumes: Theory and Evidence. American Economic Review, 65(4), 586-597. 22.Epps, T.W., & Epps, M.L. (1976). The Stochastic Dependence of Security Price Changes and Transaction Volume: Implications for the Mixture-of-Distribution Hypothesis. Econometrica, 44(2), 305-321. 23.Fama, E.F. (1970). Efficient Capital Markets: A Review of Theory and Empirical Work. Journal of Finance, 25(2), 383-417. 24.Fama, E.F. (1991). Efficient Capital: II. Journal of Finance, 46(5), 1575-617. 25.Fujihara, R.A., & Mougoue, M. (1997). An Examination of Linear and Nonlinear Causal Relationships between Price Variability and Volume in Petroleum Futures Markets. Journal of Futures Markets, 17(4), 385-416. 26.Granger, C.W.J., & Morgenstern, O. (1963). Spectral Analysis of New York Stock Market Price. Kyklos, 16, 1-27. 27.Hinich, M.J., & Patterson, D.M. (1985). Evidence of Nonlinearity in Daily Stock Return. Journal of Business and Economics Statistics, 3(1), 69-77. 28.Ho, R.Y.K., Cheung, Y.L., & Cheung, D.W.W. (1993). Intraday Prices and Trading Volume Relationships in an Emerging Asian Market-Hong Kong. Pacific-Basin Finance Journal, 1, 203-214. 29.Hong, Y. (2001). A Test for Volatility Spillover with Application to Exchange Rate. Journal of Econometrics, 103, 183-224. 30.Jain, P.C., & Joh, G.H. (1988). The Dependence between Hourly Prices and Trading Volume. Journal of Finance and Quantitative Analysis, 23(3), 269-83. 31.Jennings, R.H., Starks, L.T., & Fellingham, J.C. (1981). An Empirical Model Asset Trading with Sequential Information Arrival. Journal of Finance, 36, 143-61. 32.Karpoff, J.M. (1987). The Relation between Price Changes and Trading Volume: A survey. Journal of Financial and Quantitative Analysis, 22(1), 109-26. 33.Lakonishok, J., & Smidt, S. (1989). Past Price Changes and Current Trading Volume. Journal of Portfolio Management, 15 (4), 18-24. 34.Lam, K., Li, W.K., & Wong, P.S. (1990). Price Changes and Trading Volume Relationship in the Hong Kong Stock Market. Asia Pacific Journal of Management, 7(2), 25-42. 35.Lewellen, W.G., Schlarboum, G.E., and Lease, R.C. (1974). The individual Investor: Attributes and Attitudes. Journal of Finance, 29(2), 413-433. 36.Ljung, G., & Box, G. (1978). On a Measure of Lack of Fit in Time Series Models. Biometrika, 65(2), 265-270. 37.Liorente, G., Michaely, R., Saar, G., and Wang, J. (2002). Dynamic Volume-Return Relation of Individual Stocks. Review of Financial Studies, 15(4), 1005-1047. 38.Malliaris, A.G., & Urrutia, J.L. (1998). Volume and Price Relationship: Hypothesis Testing for Agricultural Futures. Journal of Futures Markets, 18, 53-72. 39.McCarthy, J., and Najand, M. (1993). State Space Modeling of Price and Volume Dependence: Evidence from Currency Futures. Journal of Futures Markets, 13 (4), 335-344. 40.McInish, T.H., & Wood, R.A. (1990). An Analysis of Transaction Data for the Toronto Stock Exchange Return Patterns and the End-of-Day Effect. Journal of Banking and Finance, 14, 441-458. 41.Najand, M., & Yung, K. (1991). A GARCH Examination of the Relationship between Volume and Price Variability in Futures Markets. The Journal of Futures Markets, 11(5), 613-621. 42.Osborne, M.F.M. (1959). Brownian Motion in the Stock Market. Operations Research, 1 (March/ April 1959), 145-173. 43.Pathirawasam, C. (2011). The Relationship between Trading Volume and Stock Returns. Journal of Competitiveness, 3, 41-9. 44.Phillips, P.C.B., & Perron, P. (1988). Testing for a Unit Root in Time Series Regression. Biometrika, 75(2), 335-46. 45.Richardson, M., & Smith, T. (1994). A Direct Test of the Mixture of Distributions Hypothesis: Measuring the Daily Flow of Information. Journal of Finance and Quantitative Analysis, 29(1), 101-116. 46.Ross, S.A. (1989). Information and Volatility: The No-Arbitrage Martingale Approach to Timing and Resolution Irrelevancy. Journal of Finance, 44(1), 1-17. 47.Schwarz, G. (1978). Estimating the Dimension of a Model. The Annals of Statistics, 6(2), 461-464. 48.Stickel, S.E., & Verrecchia, R.E. (1994). Evidence that Trading Volume Sustains Stock Price Changes. Financial Analysts Journal, 50(6), 57-67. 49.Mohamad, S., & Md Nassir, A. (1995). Price Changes and Trading Volume Relationship: Some Preliminary Evidence from the Kuala Lumpur Stock Exchange. Pertanika Journal of Social Sciences & Humanities, 3(2), 147-154. 50.Shiller, R.J. (1984). Stock Prices and Social Dynamics. Brookings Papers on Economic Activity, 2, 457-497. 51.Smirlock, M.,and Starks, L.T. (1985). A Further Examination of Stock Price Changes and Transaction Volume. The Journal of Financial Research, 8(3), 217-225. 52.Suominen, M. (2001). Trading Volume and Information Revelation in Stock Markets. Journal of Financial and Quantitative Analysis, 36(4), 545-565. 53.Tauchen, G., & Pitts, M. (1983). The Price Variability-Volume Relationship on Speculative Markets. Econometrica, 51, 485-505. 54.Wang, J. (1994). A Model of Competitive Stock Trading Volume. Journal of Political Economy, 102(1), 127-168. 55.Ying, C.C. (1966). Stock Market Prices and Volume of Sales. Econometrica, 34, 676-685.